I adopted this recipe from my bread machine manual. Put on dough cycle. Remove from bread pan. Fold. Let rest 15 minutes. Cut into three equal ropes. Roll out gently to about 14 in. Braid. Brush with egg wash. Let rise about 1 hour. Brush again with egg wash and sprinkle with poppy seeds, if desired. Note: I usually beat my two eggs and add about a tablespoon of water and mix. Then I pour out about 1/4 cup for the egg wash. Then I top off with the rest of the water. This can be made by hand or mixer as well. When I make it by hand, I make a pre-ferment with part of the egg/water mix and about half of the flour with the yeast. I let this set for about 20 minutes, covered. I add the rest of the ingredients (flour a little at a time) and knead. Let raise for about 1 hour or until doubled. Fold, shape and let rise a second time. Continue as above. Thanks for the great recipe. :) It looks easy enough for a beginner (like me) to try. I think we will be having this bread with dinner tonight. Another thing you can do is to wait until you take the loaf out of the oven and then immediately give it an egg wash. There will be enough heat to 'cook' the eggs. Firstly, let me thank you for an excellent and extremely useful website. I had never made bread at home till date. After going through this site for many days,I finally gathered courage to bake my first bread, the Challah, today. And it has turned out to be one of the most tastiest breads I have ever eaten. My otherwise fussy five year old daughter is also making a meal of it. I can't wait for my husband and son to taste it. And I have made it without bread machine, pizza stone or steam. I even applied tha glaze with hand as I did not have a pastry brush. 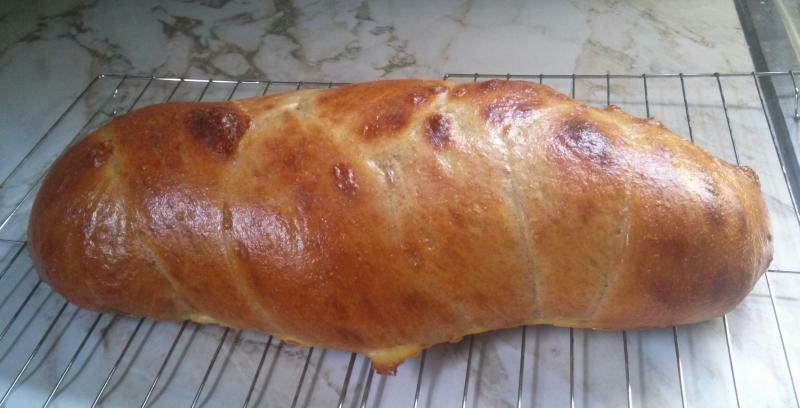 Also, I could not braid the dough as it was too sticky, so I had to shape it into a loaf. Any suggestions on how to braid it when its sticky? Now I plan to try baking bread at least once a week. Thanks again. When working with wet doughs if you wet your hands it helps, wet dough can't stick to wet hands, but it the dough is susposed to be dryer then you need to use and work in a little more flour. All depends on what you dough is susposed to be, dry or wet. one rise no preferment and shape proff and bake the reason no second rise is that fermentation continues while the breab is cut and shapped and when breading many loafs it takes time and a second rise would result in the last loafs getting old. is there a way to post a video? if there is i will make a video and show to braid a bread the way it is done in the bakerie it is quite different from tha way a home baker would do it and it is easy to do if showen but to try to tell in works ...my head spins just to think of it. I would like to see your braiding routine. I am not very good at braiding. You could post to Youtube and then link from here to it, I think?? This has been a big hit thanks to many tricks I have learned from my new friends here at the Fresh Loaf. i do love pumpkin challah! i just made a double batch of sweet potato challah and mailed one to my mother. can't wait for her to enjoy it. I have not done sweet potato yet - but now it is on my to do list. This was my first attempt at making Challah, I've never even eaten it before! The braiding is obviously done wrong but that doesn't change the fact that this bread is very moist and eggy, delicious! I think I found the secret to a nice, even glaze on my challahs, even with good oven spring. I think it has to do with the direction the gluten fibers are going when you form the ropes before braiding. I found that if I simply take a hunk of dough and stretch it into a rope shape and then roll it to get it evened out and more length, I will have a problem with the direction these ropes expand when baked--that's what leads to the unglazed part. Instead, I have learned to (gently) flatten out a ball of dough and roll it up and pinch the seam--baguette style. Then roll this "mini baguette" for length. Using this method seems to align all the gluten strands in the same direction, and they expand more evenly during oven spring. I don't cover the braided loaves during the last fermentation, and perhaps the "skin" helps contain some of that expansion as well. I also glaze with egg wash immediately after braiding, and then again after the final rise before baking. I am getting lovely, evenly glazed challahs these days--I feel like a professional (NOT!). My current favorite formula is King Arthur Flour's "Classic Challah". It's got just the right balance of sweet and savory flavors, and it's lovely dough to work with. Thanks -- all -- for posting! Suggestion -- substitute honey for sugar. I follow a basic recipe by Peter Reinhart, and have tweaked it to my likes and oven. Dissolve the honey in the very hot water. then add whole milk until the temp of the mixture drops to 105F [or thereabouts]. Add yeast and stir it in. Separately, combine very soft butter, eggs and vanilla. When the yeast is ready, bring the wet team together in the [KA] mixer. Add the flour, using the paddle. Add milk or flour as needed to get the right consistency for Peter Reinhart teachnique... I usually end up adding milk. Mix on LO for 2 minutes. Rest covered for 10 minutes. Change to hook. Mix on Medium for an additional 4 minutes. Tun out -- stretch and fold. Repeat in ten minutes. Stash in well oiled covered 8-qt bowl IN THE FRIDGE for 2 days. Expect the dough to triple in size in the container, so be prepared to deflate the dough in about 12 hours. On bake day -- turn out and divide. I usually weight out portions of 7 or 8 oz. Depending on how many portions I have, I turn each portion into a rope, and briad... I prefer six braid, which is really easy... not threatening at all. 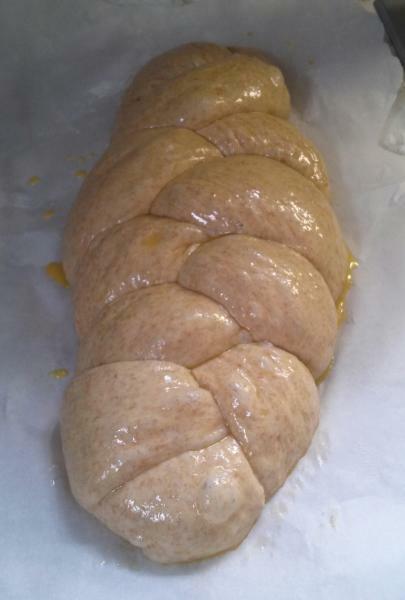 Google "challah+6+braid" and several videos will come up telling you how to do this. I end up with two large loaves, each about 2.6 lbs, and bake both at once on two separate sheets... rotating top-to-bottom and front-to-back half way through. After about 3/4 hour, you should have a nice rise [not going to be 2x]. Paint down with egg/milk glaze. After another 1/2 - 1 hour, glaze again just before putting the bread into the oven. At this time, I add poppy and sesame seeds. Preheat to 450F -- Put bread into oven quickly, trying not to lose too much heat. After 2 minutes, drop the temp to 410F. After 12 minutes, rotate and drop temp to 390F for another 12 minutes. Check internal temp. The bread is never done at this point, but I then estimate the time I need to complete the bake. Drop temp to 350F, rotate as needed, and go for it. It's important to pull Challah between 185F and 190F. Never lower than 185F, but OK but be a little higher than 190F. Honey + egg glaze = dark, mahogany color. This isn't burnt bread, but caramelized sugar [honey] with egg. You'll realize this as you taste it. One last comment -- If you do a 5 braid or a 6 braid, the final loaf will be "taller" than a 3-braid or a 4-braid. Another last comment -- Adding milk makes the crumb even, smoothe. 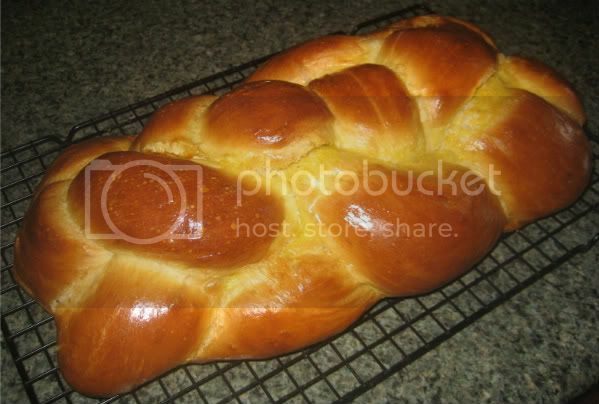 I have a recipe for challah I have used for over two years and it always came out very good. Now for some reason, I just have no luck with the fermentation. I used to be able to make a couple loafs the same day. Now way. I just can't figure out what can cause it not the rise. I made other bread and the yeast worked fine, so it isn't that, the flour is the same too. Any suggestions? What did I do? Would appreciate any and all advice, thanks in advance! I don't know the answer, as I've never baked challah myself, however the consensus is do not braid too tightly but do not leave any spaces either. Make your dough (have a look for a good recipe), braid it and allow it to rise then bake. I'd be interested to know how you fare with this. Best of luck. Can you tell me your recipe and method? ...well, lesse here, I used the first recipe on this post. I rolled out three long logs, started the braid halfway, tucked ends, turned it around, braided other half, tucked ends. I suspect I let it rise too long as I have a sad history of doing that... Painted on egg wash, dumped hot water into steamer pan in oven, baked. It tasted just fine, but did look a lot like a big ole slug. Thanks for your attention and help, btw! I want to learn to braid, I've tried it since and same thing happened (it was a potato bread this time). Here's Wikibooks challah formula, their version as of earlier today, so at least there is one in baker's percentages here at this site. I can't say whether this formula is any good or not, I haven't tried it yet, but I was looking at it, and thinking I might like to try it, and that means I tend to study a lot of formulas when making my own, provided multiple formulas are available. I've inserted some ingredients mentioned either by other authors, or from the Wikipedia article about challah, but there are no values provided. bread flour 100.00% The most common flour to use, though flour mixes are used by some. dry yeast 2.19% Too high. Reduce to at least 1%. Does anyone who knows anything about challah have any comments or criticisms of the above total formula? The only major flaw in it that I can perceive is far too much yeast, but it can be reduced, as well as substituted per ratios with another yeast type. Of four formulas I've checked, Reinhart uses the least. If you reduce the Wikibooks "dry yeast" to 1% "active dry yeast", you'll have slightly less yeast than Reinhart's formula, though he uses "instant dry yeast", which is not a 1:1 substitution per equivalent fermentation-time period, his number appears lower. The basic rule is, the less yeast you use, the longer the fermentation period will be, and one benefit is a reduced yeast flavor. Hamelman likes to use 1/3 high-gluten flour, perhaps making his a little chewier, and sturdier, perhaps better for spreading and holding toppings. Gisslen eschews egg whites entirely, and massively increases egg yolks, so his is likely the most yellow, and via my own experience, this should give less of a dryness taste perception, but it may decrease rise somewhat, and increases cost. Both Hamelman and Reinhart supplement whole eggs with additional egg yolks, thus the Wikibooks formula will be lighter colored or less yellow than the others. While it appears the Wikibooks recipe has the most water, it is unfortunately not as simple as that, there are water fractions in egg whites, and some in yolks (as well as fat in yolks), and I haven't yet done enough analysis of the three other authors' formulas to normalize them to "flour, water, and fat" levels. 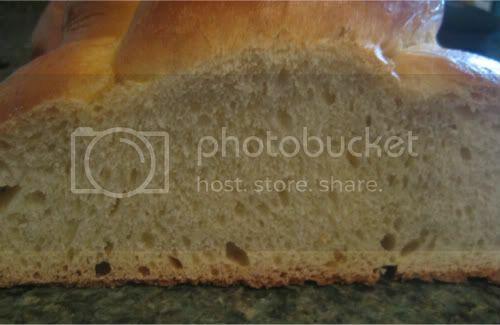 However, this particular Wikibooks recipe is, except for the excessive yeast, sort of "normal".